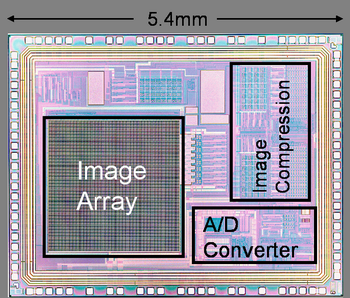 S. Kawahito, M. Yosihda, M. Sasaki, K. Umehara, D. Miyazaki, Y. Tadokoro, K. Murata, S. Doushou and A. Matsuzawa," A CMOS image sensor with analog two-dimensional DCT-based compression circuits for one-chip camera", IEEE J. Solid-State Circuits, Vol.32, No.12, pp.2030-2041, Dec.1997. S. Kawahito, M. Yoshida, M. Sasaki, K. Umehara, Y. Tadokoro, K. Murata, S. Doushou and A. Matsuzawa, "A compressed digital output CMOS image sensor with analog 2-D DCT processors and an ADC/Quantizer", Dig. Tech. Papers, IEEE Int. Solid-State Circuits Conf., pp.184-185, Feb. 1997.